Who are you? Where do you go to school? What’s your program? One fun fact about yourself! 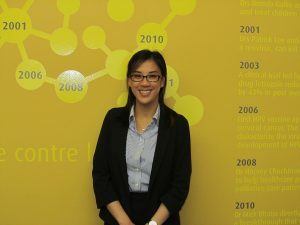 Candice Tang at Canadian Cancer Society’s office in Toronto. I am a second-year Master’s student in the Applied Immunology program at the University of Toronto under the co-supervision of Drs. Slava Epelman and Milica Radisic. My research focuses on the immune cells of the heart and how we can manipulate them with drugs to promote healing during cardiac injury. We are investigating an emerging method of drug delivery by embedding the drug into a biomaterial. A fun fact about myself is I used to be a part-time clown – I’d put on a silly costume and make balloon animals for kids at festivals and parties! Why did you want to do this type of internship? I wanted to do this because I recently developed an interest in scientific writing and research communications. I have always enjoyed reading scientific articles and learning about the latest, cutting-edge research and I loved sharing my knowledge with my family and friends. I strongly believe research can benefit society in so many ways, but it is important for the public to understand (and correctly interpret) it – and I wanted to help bring science to the public. After doing some research, networking with professionals, and receiving valuable mentorship, I applied for this internship and was ecstatic to join the Canadian Cancer Society with the support of BioCanRx! What skills have you been able to further develop? My plain language writing skills and analytical skills are the two I have developed the most so far. As this is the first time I’ve taken on such a role, I had to learn the Canadian Cancer Society writing style and focus on replacing technical jargon with plain language. This requires a lot of practice and patience: writing, editing, re-writing, and so on. When it comes to a research topic I am not very familiar with, I am challenged to analyze and interpret the research to the best of my ability, then to convey this information in a clear and concise manner. These skills have allowed me to improve my reading comprehension and quality of writing. What was one memorable moment during your internship? One memorable moment I had during my internship was writing my first feature article for the Canadian Cancer Society website: a summary of three research grants the organization is funding on immunotherapy, set to appear as a homepage banner throughout October. Having a background in immunology, I was excited about writing how immunotherapy is an emerging and important field in cancer treatment. I also had the freedom to choose my own examples and write the article in my own style. For 600 words, I felt like this was one of my biggest achievements. How did this experience impact your career development? This experience has turned science communications into a serious career pathway for me. This internship has opened doors to other writing opportunities, introduced me to the workforce, and provided me with the skills I need to move forward with my career. Whether I work for a non-profit organization or within the private sector, I hope reading and writing about new and exciting research will be part of my job. What is your hope for cancer treatment/care in the future? From being a student and a science communicator, I have learned the importance of critically evaluating and interpreting science, including my own written work. When communicating science, it is important to balance promising results with the limitations of current research, and to emphasize “how far away are we?” I predict that cancer care will be changing in the next decade, as we incorporate advanced techniques to improve everyday diagnosis, treatment, and prevention strategies. My hope is that people will develop a better understanding and greater appreciation of the research that has made a lot of these advances possible.